This is not Photoshop as you might have thought at first. 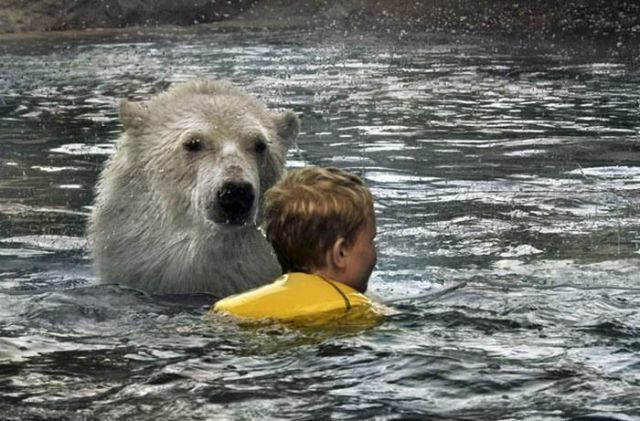 Children can swim with polar bears in Canada. 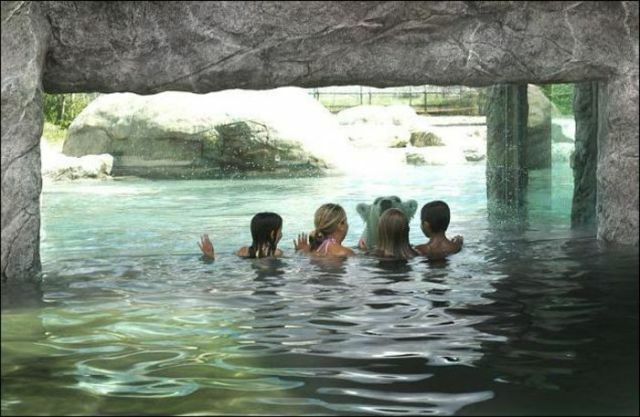 The Polar Bear Habitat is a water zoo in northern Ontario that allows kids experiencing an outdoor swim with these beasts since 2004. Of course, humans and bears are in two different pools that are separated by a layer of bullet proof glass that is about 9-10 cm thick. Still it is a real shock for those people who see such a scene for the first time in their life. i think only the fourth picture is real....the rest are fake ! the glass between them makes them look fake. they are all real shots. why would anybody make 3 fake pics and the 4th real? makes no sense, i think they all are real. just google "The Polar Bear Habitat"
It would be an interesting experience. Hopefully, for the bears, too. I live in Ontario, Canada and I've been to that place. The pics were taken in the Wading Pool. "Many of our visitors have told us that this area was one of the highlights of their experience at the Habitat. 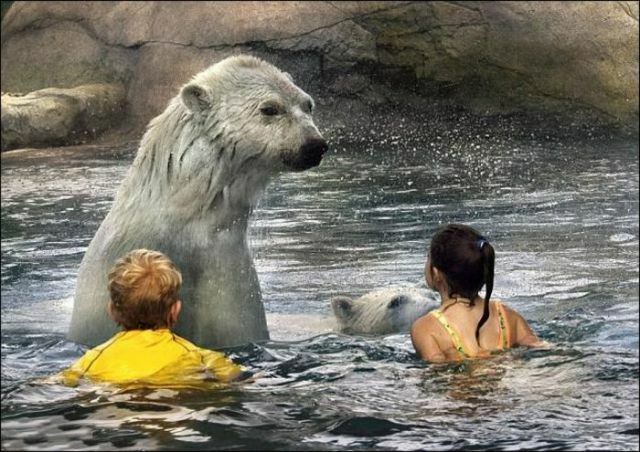 Staring into the eyes of an immense polar bear, while swimming only inches away from him, is to be remembered! You can do that, because our wading pool is separated from the bears' pool by five centimetres (approximately two inches), shatterproof glass, with good optical qualities. Photographs make it appear that the swimmer is actually in the water, with the bear." 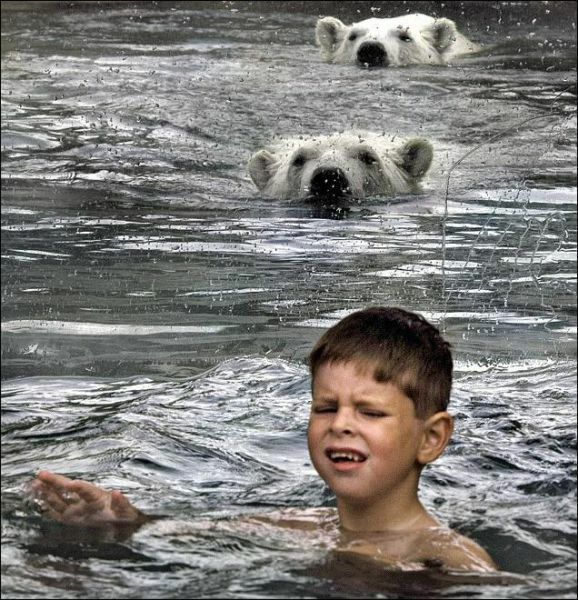 Look at picture #3 closely to see the glass separating the swimmer from the bears. A place worth visiting!